1903-RB-DST is rated 4.5 out of 5 by 11. Rated 4 out of 5 by Neal from Great value for such a quality product I just completed the instal and was pleasantly surprised to see the level of quality for the price. I did some shopping around prior to purchasing and paid half the price for the other like models. I will see how it holds up after time but all initial indications seem to favor a long life. 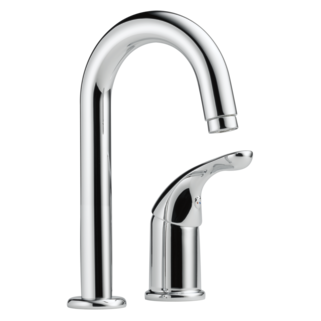 Rated 5 out of 5 by Dave73 from Stylish for our bar I bought this faucet for our new home we're building. Product finish is exactly what I wanted and will look great in the bar where it will be installed. Faucet was packaged very well which protected the finish and all parts were in the original packaging. Rated 5 out of 5 by Ramsey Interiors from Great look for the price I purchased this faucet for a client's basement bar renovation. We liked the modern lines and high arched neck. The Oil Rubbed Bronze finish is perfect for the space. Rated 3 out of 5 by rgg50 from Good, but don't leave out aerator washer Installed May 2014. Working fine now. But, initially I left out the aerator washer. Surprisingly, this causes water to flood thru counter-top opening and onto floor beneath faucet. Discovered the missing washer, inserted it, and all was fine. But now I worry what will happen when that washer goes bad some day. 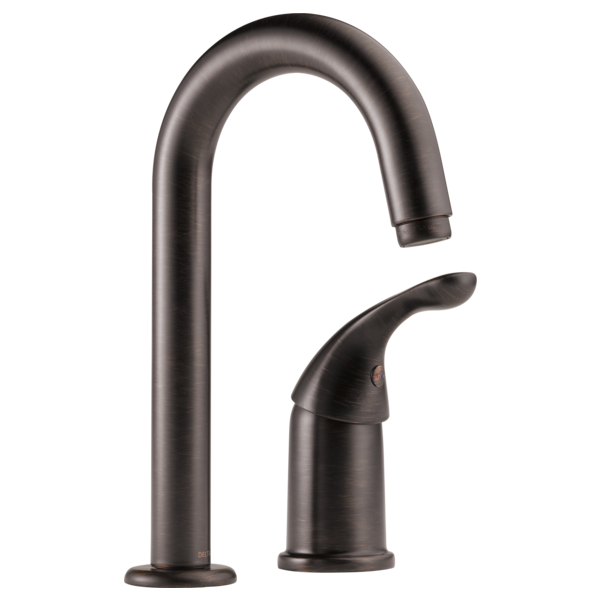 Do you have a high arc faucet with a single handle in the center? I would like 6-inch clearance from the deck to the aerator. But both my wife and I are left-handed, so the handle on the right does not appeal to us. Thank you for your question. 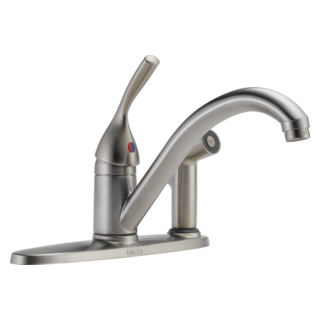 Delta Faucet model 1903-DST does have a six inch clearance from the deck to the aerator. The handle can be mounted on either the right side or the left side. How far can I separate the handle and spigot? Using with a vessel sink on a granite countertop. Is the spout on the 1903 DST have a swivel function or is it locked in a fixed position. I have a delta faucet that I neet to replace. 4 3/4&quot; tall (valve off) 1 7/8&quot; diamiter at base I beleive it was a bar faucet. The only one I see in the online catalog now are taller and have a larger diameter. Is there a way to prevent the faucet to swivel? Some sort of restrictor? 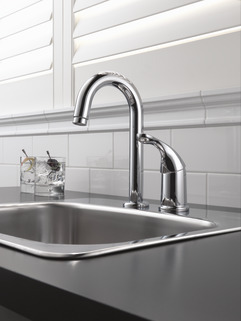 Is the Classic Single Handle Bar/Prep Faucet able to be installed with a separate vegetable sprayer? 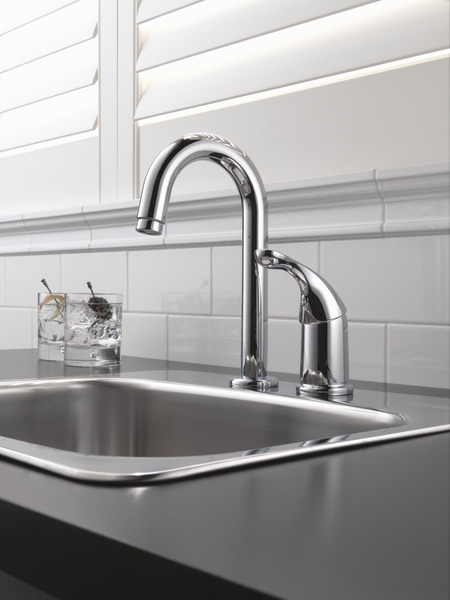 I looked at other Classic line faucets, and they have a separate number for the faucet that would be used with a separate sink-located sprayer. I didn't see that separate number with the Clasic Single Handle Bar/Prep Faucet, and there were no details on its ability to be used with one. 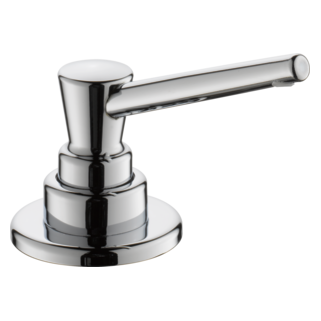 Can you provide me with the number of the faucet that would be able to use a separate or whether this one can be used with a separate sprayer?